What does it take to become Chief Flying Instructor? Home > News > What does it take to become Chief Flying Instructor? 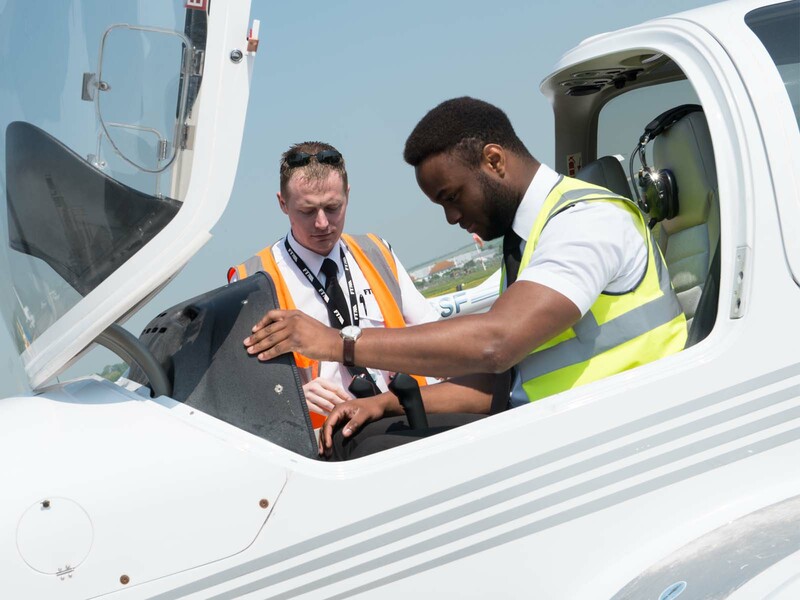 Becoming an airline pilot might be the dream but it’s not the only way to have a career in aviation. Flying Instructors are just as much in demand and the job is just as challenging – more so, some would say – as flying an airliner. Alexandra O’Loughlin asked FTA Global’s Chief Flight Instructor James Piper what motivated him to pursue his career. Q Why did you want to be a flight instructor? A In all honesty, it wasn’t a career path I’d considered. Growing up my focus had been on becoming an airline pilot. But the industry was still recovering from the global economic recession when I completed my training in 2010. Pursuing my dream of becoming a pilot was looking challenging. As I approached the final stages of my flight training, one of my instructors suggested that I consider a career as an instructor. My instructor recognised skills and abilities in me that I hadn’t even recognised. I’d always enjoyed helping others on the course when I was studying, sharing advice and the tools I had already learnt. So, while a career as a flight instructor wasn’t a childhood dream, it was something that came naturally to me. I completed my FIC (Flight Instructor Course) with Pooleys Flying Instructor School, based at Brighton City Airport. The school has an excellent reputation and being based at the same airfield was a logical choice. I finished my training with FTA in June, started my instructor course the following month and completed my instructor training in September. When and where did you start your career? As soon as I completed my Flight Instructor Course, I headed to the CAA to get my rating issued. That same week, I started working for FTA. I remember my first instructional flight was a trial lesson. The flight went well. I didn’t tell the student that it was my first flight until afterwards. I still remember the look on his face – it was priceless! From a personal perspective, the work-life balance is a big plus. I have a young child and at the end of the day I go home to my fiancé and daughter. That time with my family and friends is very important to me. When it comes to the teaching, I enjoy seeing a student’s progress during training, from day 1 through to completing the final exams. One highlight was the first student I took from zero flight experience to completing his commercial training. When he was hour-building, we went on a long flight to Swansea. He’d arranged to meet up with his family, and I remember meeting for breakfast in the airport restaurant. It was heart-warming to see his family’s pride in what he was accomplishing. I also get a big kick out of training students who have struggled during their training with other schools. To meet someone who has, for whatever reason, struggled and help equip them with the skills and confidence to complete their training is really rewarding. I believe it’s something our instructors do very well. What advice would you give to aspiring cadet pilots? Visit all the schools, do your research and find out exactly what you’re getting for your money. Ensure that have enough money for your training and additional funds in case of emergencies or unexpected hurdles. What would you say to aspiring flight instructors? Don’t disregard flight instruction as a career. The starting salary may not be particularly high but, as you progress, you can expect to earn a very competitive salary. You’ll also enjoy set rotas, be part of an extraordinary team with a rewarding job, and enjoy a good work-life balance. If teaching is something that interests you, then go for it. You need to be someone who enjoys supporting and developing others. Flight instructors need patience, self-confidence and self-assurance. If I didn’t feel instructing was something I could have done, I wouldn’t have gone for it. That said, if it had not been suggested to me, I’d never have thought about it. And the best part is…I fly almost every day! I start my day with a coffee while I check the schedule to see when I am flying and with whom. I usually have a flight booked in first thing, but, if not, I’ll catch up on some admin. If I’m scheduled to fly, I will meet with the student and brief for the flight. If the weather is suitable, then we’ll fly. In the early days of my flight instructional career, I would have taken the student through the elementary stages of flying only. I’ve progressed through the various flight instructor ratings and gained significant experience over the years. I am now able to deliver all stages of our commercial flight training, as well as examine students for their final tests. As an advanced instructor, I could do anything from an IFR (Instrument Flight Rules) flight to Le Touquet, general handling in the local area, VFR (Visual Flight Rules) navigation to Southend or perhaps, as the day progresses, send a student solo. No day is ever the same, and the variety of students and flight phases keeps the role interesting. What should students be aware of? Preparation is key; a one-hour lesson is not just a one-hour lesson. You need to prepare appropriately before and after the lesson. Reflecting on what could have been done differently, or what went well, can help students to learn and plan for future experiences. Our online flight record system, FlightLogger, is brilliant for this. A student can read through all their training records as soon as the instructor has logged the details. It’s easy to identify the students who will do well in their training. These are the ones who are in school daily, putting in the hours, immersing themselves in the school and in training. As the Chief Flight Instructor, it’s my responsibility to monitor students’ progress and FlightLogger allows me to see how well their training is going and see who may be struggling. How did you train for your CPL? My first ever lesson was a birthday present in 2007. The flight was with an FTA instructor and it was after speaking with him that I realised I could afford to complete a Private Pilot’s Licence (PPL). So that’s exactly what I did. I continued with a PPL, which took around a year, flying part time. The next stage was my ATPL (Airline Transport Pilot Licence) theory. I initially took this via distance learning but found it hard to study with so many distractions. I enrolled on a residential course which took me six months before embarking on the final, advanced stages of my flight training. In between completing the theory and starting the advanced flying, I got a well-paid job and saved every penny. However, I still needed the help of family members to afford the commercial courses. I completed the MEP (Multi Engine Piston Rating), CPL (Commercial Pilot’s Licence) and IR (Instrument Rating) full time in 2010. The airlines are still an opportunity and a thought at the back of my mind. I love instructing, and it has proved a fantastic career. I am fortunate to have been promoted over the years and now I am Chief Flying Instructor, with responsibility for our team of instructors. Last year, I also completed Examiner Courses for both CPL and IR, so I can examine students right at the end of their courses. I am not one for setting hard goals and who knows what the future will bring. I am very happy, and an alternate career is only something I would consider if I could have the work-life balance that I have now. I love flying and it will always be a big part of my life.